Cabin Fever is a beautiful log home located in Black Bear Falls, Gatlinburg's community. This log home is decorated in rustic log furnishings and original photos from local photographers. Located just a few minutes from downtown Gatlinburg, but in a setting you'll feel like you're miles back in the woods. Cabin Fever has two covered porches. The full covered back porch allows you privacy whether you are rocking in rocking chairs, or enjoying a dip in the outdoor jacuzzi while viewing the beautiful woods and a clear shot of Mt Leconte. You will love the swing on the porch. Cabin fever has two bedrooms, each having unique log furniture from out West, and gorgeous log walls. Each suite has king beds, and a jacuzzi tub in a separate bathroom. Giving each guest their privacy while sharing this beautifully decorated cabin. The upstairs bedroom is open to below, as it is a loft bedroom. The full kitchen allows you to stay in while enjoy cooking and dining, or enjoy cooking out on the charcoal grill. The kitchen is fully furnished. You'll enjoy the beautiful scenery from a top black bear falls. One of the best views in Black bear falls. You'll enjoy sitting out in the wooden rockers on the full size porch year round. Or maybe the outdoor hot tub on the deck is more your taste. Either way, you'll feel very relaxed in this setting. Enjoy a warm fire in the rustic rock fireplace located in your den, surrounded by windows with beautiful woods surrounding you. 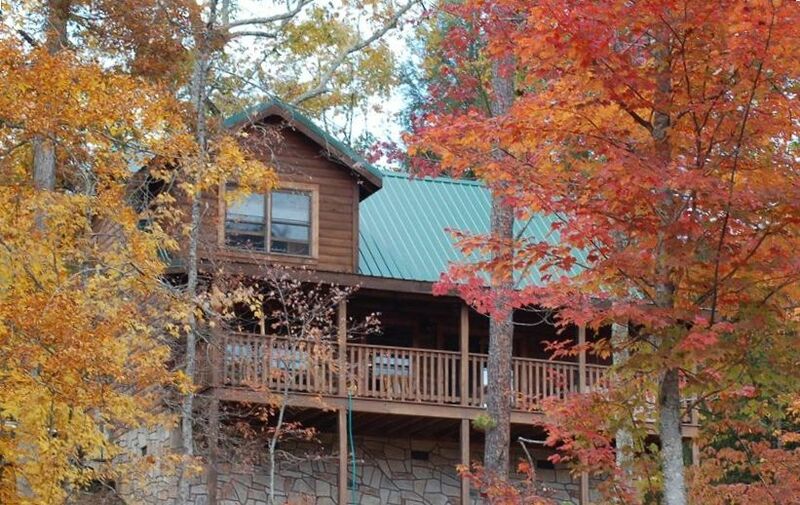 Cabin fever is located within two miles of downtown, and is an easy drive to the National park for a hike, wildlife viewing, or a short drive to the grocery, shopping and Dollywood. The community for Cabin Fever also has a pool and clubhouse for rental guests. Enjoy complimentary WiFi while staying at Cabin Fever, so bring your wireless capable computer. Also we offer free long distance calls. there is a ethernet cable on site too. Guest have loved this cabin. Our no smoking policy has allowed us to keep the cabin clean and enjoyable for all. And yes we welcome your well behaved, house trained, and flea controlled pets. A small non-refundable pet fee of $50 per pet applies. You will love our new fenced in area for dogs....We love dogs too !! We also supply a dog gate if you choose to use to contain your pet in the house in an area. Only a two mile drive to downtown. Great views of Mt Leconte... cabin sits up high. parking for 2-3 cars. also will hold a trailer if pulling a motorcycle. We offer unlimited WiFi for our guest at no charge. Bring your wireless capable computer. tv's in both bedrooms and den. Great view from porch... hanging swing, rockers, and location of hottub. Courtyard area fenced for pet containment. Only cabin in Black Bear falls with a fenced area. Fenced in area for dogs. You and your pet will enjoy being able to skip the leash. This cabin was perfect for our family of five and pup. The view from the porch / hot tub was stunning. The beds were huge. The cabin was so clean, finishings were very nice, and kitchen was well stocked. We were tucked away in the mountain but close enough to get to the action quickly. We will definitely stay here in our next trip to Gatlinburg. Very quiet. Great for small family and dog. Very quiet. Great for small family and dog. Cabin was very clean and comfortable. Close enough to store if you need groceries, but very quiet and private housing/community area. Whole family loved it. Melanie was an incredible host and very quick to respond to all questions regarding my stay. The home is beautiful and perfect for pets! My two dogs and I went on vacation there for 5 days and loved every second! The house is beautiful with incredible views! The yard with the fence was so perfect for the dogs. A lot of the national park trails aren’t dog friendly, so we actually walked around the property a few times for several hours. There are plenty of hills and beautiful vistas within the grounds themselves. Will definitely be back! Thank you so much to our wonderful hosts for such a perfect, relaxing vacation. Just what we needed! We are so grateful you chose us to spend your vacation with. glad the pups enjoyed it. we look forward to your next visit. It was clean, well kept and the perfect size for 4 people. The scenery was amazing along with just the beauty of the cabin. Everything worked great!! We would definitely recommend this cabin to anyone. We absolutely loved this cabin! We had a wonderful time in this cabin. It was very clean and they had everything that we needed. Our dog Zoe loved it as well. This cabin feels like home away from home. The owner was wonderful and was available if we needed her but everything was perfect and we didn't have to contact her. Thanks for sharing you beautiful cabin with my family and we will be coming back. Great experience! We will be back!!! My wife, 2 teenagers, pooch and I had a fantastic time. The cabin was great, view was beautiful, and convenient to everything. Plenty of room for our 4 & 1/2. Only wish we would have stayed longer! Wonderful experience. Most of all, the owner is fantastic. We made our plans last minute, and she was most accommodating. We had a couple questions upon arrival and she was so helpful and professional. We can’t wait to go back to Cabin Fever! !